This mid size green CERT backpack is great for any kit. Has a large outside pocket (8.5x10x1.5) for quick access to needed supplies. Plently of room for a hard hat, pry bar, and other essentials. 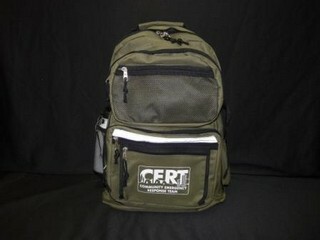 For a larger CERT backpack see the related items below. PLEASE NOTE: This backpack comes with the standard CERT graphic printed in white. For orders of 50 or more units the Graphic can be customized for minimal cost. Blank versions in numerous colors are also available. Please contact us at 425-881-5354 for more information.